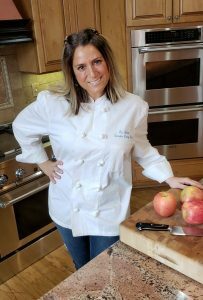 In a land not so far away, Jarrettsville, Maryland, resides Chef Liz Sitaras Wilcox and she teaches cooking and baking to adults and children, group classes, dinner parties, private classes, team building, girls night out and more. I recently learned about Chef Wilcox when multiple cookbook author and baking expert, Nick Magieri, came to Baltimore for a private class that she and others coordinated. Wow, I thought I knew all the cooking classes in the area, but this my friend is the real deal with Chef Wilcox. When her initial dreams of being an architect/interior designer were dashed because of her dyslexia, she moved on to her passion; cooking and baking. With the help of a math teacher, who suffered from dyslexia as well, taught her how to adapt and navigate her disability into a viable way of learning. She enrolled in the top culinary school in the country, the prodigious Culinary Institute of America (CIA), where she matriculated through two programs earning two degrees; Culinary Arts and Pastry. While at the CIA she was an intern at The TV Food Network on their shows during their early days featuring chefs Susan Feniger, Mary Sue Milliken, David Rosengarten, Michael Lomonaco, Emeril Lagasse, Mario Batali, Sara Moulton and more. A resume reveals a short tenure at Hillendale Country Club with Chef Tony Tallucci who, later on, had her join him at a new Radisson Hotel in Wilmington Delaware. After a year, Chef Wilcox moved back to Baltimore to be the pastry chef at Baltimore’s Center Club for four years. Love, marriage and the baby carriage took her out of restaurant kitchens and into her own home where she has been teaching ever since. An over-sized kitchen, designed specifically to accommodate students, creates an environment for up-close and personal attention from the chef. Chef Wilcox says a common problem she sees, “People can be good cooks, maybe great cooks, but baking, a precise medium, will stymie them.” A number of her students come in for group or private lessons, to hone their baking skills and she shows them “trucs of the trade” which opens the door to easier learning and an improved skill set. Having navigated her own dyslexia, she is especially attuned to children with the same disability and has worked with the Odyssey School. Classes can be day, night or weekends; one-on-one or multiple students (team building, moms groups, fun girls night out, dinner parties), adults and children (starting at a mature seven years of age); and beginners on up to experienced cooks who want to refine their baking. Cooking or baking – each class is customized to your wants and desires. Chef Wilcox runs classes September through May. Here is further information on how Chef Wilcox can create that special afternoon, evening or weekend for you as an individual, family or group – Email: jeppigirl @ gmail.com Facebook: BasicKneads Phone: (410) 877-5199. The majority of the classes are held in Jarrettsville.